Sydney's Double Bay has sprung back to life, with many believing it is close to regaining its mantle as a Mecca for Sydney’s influential, talented and famous. An extensive street beautification program - undertaken by the local Council - has attracted new retailers and a younger demographic, The Cosmopolitan Centre is buzzing again, a $50-Million Woolworths is about to open, and The InterContinental is refurbishing the former 140-room Ritz-Carton Hotel in Cross Street. The Bay Residences, located in the heart of the village. Marketed through CBRE, just six apartments remain in The Bay Residences which is scheduled for completion by the year’s end. The low-rise development in tree-lined Bay Street, Double Bay’s most desirable boulevard, is ringed by exclusive retailers including Leona Edmiston, Carla Zampatti, Max & Co., and Casonovas, and funky restaurants Mrs Sippy, Limoncelo, Pelicano and Niji. The Bay Residences will also incorporate retail space with two large retail stores on ground level. 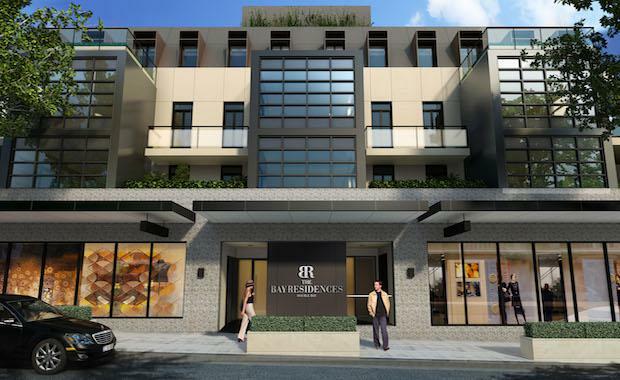 Nico Tjen, the developer of The Bay Residences, says the renewed retail activity has definitely helped attract a younger demographic to his apartments than is traditional for Double Bay. “Most people think Double Bay real estate is prohibitively priced, but that has changed,” said Mr Tjen, who has completed more than 10 high-end developments since establishing Oceania Property in 1991. Kann Finch in keeping with Double Bay’s sophisticated European-style ambience. It combines classic stonework and Juliet balconies with crisp geometric facades of burnished steel and glass and a mansard roof. The interior finishes are elegant and tasteful, and step up in opulence the higher you go. The penthouses are quality personified. Kitchens have dark, rich timber veneer panelling, stone benchtops, a full suite of premium Miele appliances, a walk-in pantry, and an integrated fridge, freezer and wine cabinet. Bathrooms and ensuites comprise European-style stone-topped vanities in harmony with sculpted glass and frameless mirrors. “To be able to buy anything in Double Bay at these prices is rare – and what’s even more remarkable is that the apartments are in vibrant Bay Street, the cherished heart of the village,” said Ben Stewart, a director of CBRE. “An added bonus is that there are just 13 apartments in the development, with no costly communal facilities, so levies are very reasonable."